This is just a note for anyone searching for potential side effects of Revlimid. 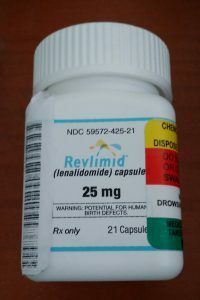 Revlimid can cause nausea. I notice that I feel ill for a few days while I’m off steroids. The steroids actually help with the nausea. Dr. P. says that they give dexamethasone as an anti-nausea drug, so that explains why I feel ok on the days I’m taking dex. He said that he has had a few patients with MDS on 10 mg Rev/day who have had to quit because of the nausea and GI trouble. He had one pt who lost 30 lbs. $5250 a month for Revlimid? A fellow listmember on the ACOR MM list has been in touch with Celgene quite a bit, to get her husband on the new drug, Revlimid. 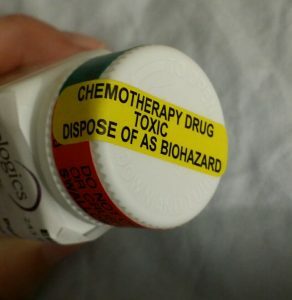 Those of us in the trials get the drug at no cost to ourselves, but when it’s approved for use with MM, we’ll have to pay (one way or another). I’m going to start an email campaign to let the media know about this. So far, I’ve only written to CNN and had no response. I know. I’m expecting too much. drug, but he has to adhere to the protocol of the trial. I see Brrreeeport is still going strong. I managed to get onto the Revlimid trial with Decamethasone and this has been the BEST thing that has happened to me in 2 years (since my stem cell transplant)! After Velcade and then a very small special trial my monoclonal protein numbers took right off into the stratosphere! I was very worried. Then within 2 weeks of Revlimid they dropped in HALF! Yes 50%. Two weeks later they halved again! M count was down to less than 15 two weeks ago! I pray that this trend continues and that some maintenance diet will hold it at or close to zero soon. Aspirins seem to be a safe counter to the clotting worry – and given my choices, I am NOT worried about a clot given the gift this drug has given so far! What a fine Christmas gift! I only hope it works for all fellow Myelomians! The thought of Revlimid trial staying suspended is scary. Have not heard what the latest is from Celgene, FDA or anywhere else. Does anyone know what’s the current state? Since I feel that the CNTO 328 trial is not working for me, I’ve been thinking about my next treatment step. I’m almost 100% sure that I want to enroll in the Multicenter, Open-Label, Single-Arm, Expanded Access Program For Lenalidomide Plus Dexamethasone In Previously Treated Subjects With Multiple Myeloma. It involves high dose dex, which isn’t very appealing to me. I’d have to take the dex at 40 mg a day for 4 days, with 4 days off, over a period of 16 weeks. That would be the longest I’ve ever been on high dose dex. Revlimid is supposed to be 50 to 100 times stronger than Thalomid, which I took back in 2003. Thalomid worked for me. I think it may have been more the dex though. My response slowed down after I went to just 40 mg dex a week. One thing I’m concerned about is that my MM seemed to have become resistant to dex. Will the high dose dex do more harm than good? I just know that I need to choose another treatment. I’m weary of having to go for IV treatments, so the pills seem very convenient. I’m tired of being poked. It seems my veins are too. Each time I go, there are multiple attempts to get an IV going. I have one good vein on my left hand, and it has its scars. BOSTON — A Food and Drug Administration advisory panel has voted to recommend that the agency approve Celgene Corp.’s oncology drug Revlimid, the company said Wednesday. Wednesday morning, ahead of the meeting. Celgene is seeking to have the drug Revlimid approved for the treatment of transfusion-dependent anemia due to certain blood cancers known as myelodysplastic syndromes. abides by the recommendation of its expert panels. approve Revlimid by Oct. 7. The company already markets a version of thalidomide called Thalomid, for the treatment of leprosy, and Alkeran, a treatment for the cancer multiple myeloma.